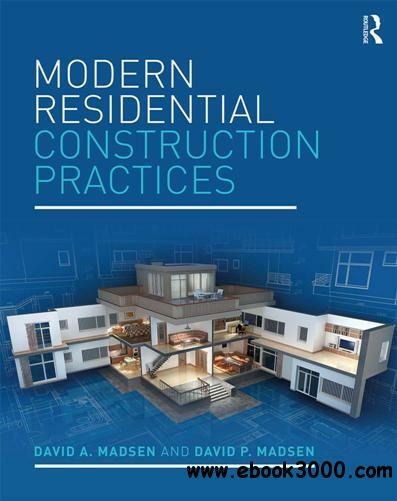 Modern Residential Construction Practices provides easy-to-read, comprehensive and highly illustrated coverage of residential building construction practices that conform to industry standards in the United States and Canada. Each chapter provides complete descriptions, real-world practices, realistic examples, three-dimensional (3D) illustrations, and related tests and problems. Chapters cover practices related to every construction phase including: planning, funding, permitting, codes, inspections, site planning, excavation, foundations and flatwork, floors, walls, roofs, finish work and cabinetry; heating, ventilating, and air conditioning (HVAC); electrical, and plumbing. The book is organized in a format that is consistent with the process used to take residential construction projects from preliminary concept through all phases of residential building construction. An ideal textbook for secondary and college level construction programs, the book is packed with useful features such as problems that challenge students to identify materials and practices, along with research and document information about construction materials and practices, useful summaries, key notes, a detailed glossary, and online materials for both students and educators.